One feature that's at least an option on most of today'c cars is an automatically dimming rear view mirror. And it's also one that's really easy to add to the Fiero! There are several aftermarket kits, but there are only two manufacturers, the most common one being Gentex. They don't sell to consumers directly though, go to Mito if you want to purchase one directly. How does an autodimming mirror work you ask? Well, there is an ambient light sensor facing forward, measuring the ambient light and determining if it's day or night. 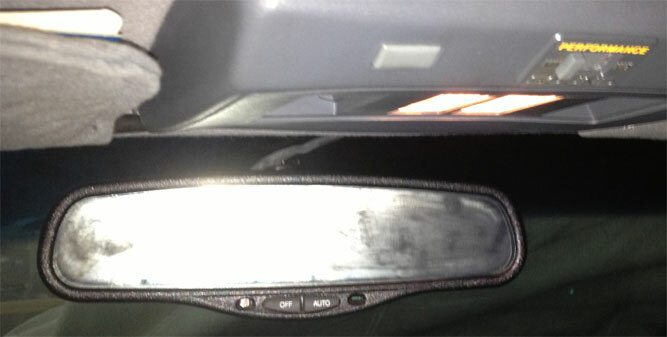 There is also a second sensor built into the mirror facing rearward. It measures if someone is behind you with their headlights on. If that's the case, and if it's dark outside, the mirror glass automatically tints. If the car behind you is gone, the glass automatically untints. To do this magic, the mirror needs power though, and no, you can't tap into the dome light power wire, because that's hot at all times, so you'll need to run at least two wires along the A-pillar, power and, while you're at it, backup lights. This is required so that when you shift into reverse, dimming is also turned off. Before you run out and buy one, be aware that there are different options to choose from. The base version is the mirror only, but there are also versions with outside temperature display, and/or compass display. 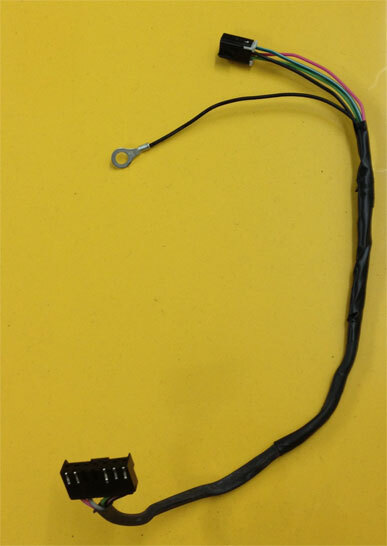 While the compass does not require extra wires, the temperature sensor requires two wires to run from the mirror to the sensor. But once the A-pillar cover is off, it doesn't matter if you run 2 or 4 wires up to the dome. Those mirrors aren't cheap though, especially if they come with an extra display. eBay to the rescue, there are literally dozens of offers of all kinds of mirrors from different vehicles for very reasonable prices. You can also get an OnStar version of the mirror which features extra switches and LEDs you can use, or versions with built in dome lights (not really required in a Fiero unless you have a convertible). Other things to look out for: make sure it doesn't have an "airbag" symbol, and get one with a pigtail, because the connector is near impossible to get elsewhere. Also, the Fiero needs the "domestic wedge mount" version, and earlier Fieros may need an adapter since the old base was smaller. I bought one for an 98-04 Blazer/S10/Bravada, with pigtail for $9.95 from Indiana Auto Salvage. The size is identical to the original Fiero mirror, and it snapped right onto the windshield. Literally took 5 seconds. But beware: taking the mirror off again is tricky! This one came without an attachment torx screw, but had a snap-on fastener instead. You need a small screwdriver to disengage a locking tab by inserting the screwdriver into the mirror base. Once you have your mirror, solder wires to the pigtail wires, and shrink wrap your connections. Mechanical installation of the mirror is a snap. Literally. Removal of the headliner is not required, but the dome lights have to come off, as well as the left visor and left A-pillar cover. I grounded the pigtail right at the dome lights, and I moved two extra wires that were in my pigtail (for an extra autodim exterior mirror) to neighboring cavities should I ever decide to upgrade to a mirror with a temp sensor input. I also put in a 4 way Metripack connector (see image). Makes it easier to diagnose problems should there ever be one. After installation, check if you can turn the mirror on and off with the ignition on. The green LED should come on if it's on. Viola, you're done!